Kristina’s passion for genealogy began with interviews of her paternal grandparents in 1986 with the discovery that each had lost a parent at a very young age and letters from her Mom about her own family research. 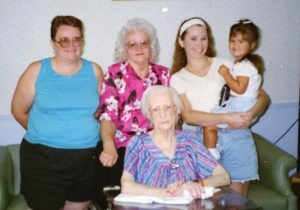 In 2005, her mom Sue decided Kristina would be the recipient of our own 30+ years of research. Kristina’s journey into DNA started in 2006 with Y-DNA and mtDNA testing and expanded to atDNA testing in 2012. As her understanding of how to use DNA evidence expanded, she began helping others who were searching for their biological roots. She received the Boston University Certificate in Genealogical Research in 2018. She is a member of the Association of Professional Genealogists and the National Genealogical Society. She serves as Vice President of the West Florida Genealogical Society in Pensacola and as a board member of the Baldwin County Genealogical Society in Foley, Alabama. Clever Genetic Ancestry was launched in 2017. Our goal is to help people discover their own family history, learn the best ways to build family trees with a solid foundation, and understand how to use DNA evidence.